Dining in Korea is no longer a challenge for Muslim tourists visiting Korea. For one thing, Korean cuisine offers a wide number of dishes using grains, vegetables, and seafood. If you are craving a sumptuous meal that includes Halal meat (beef or lamb slaughtered according to Muslim ritual), you can visit one of the Halal restaurants near the Seoul Central Masjid in Itaewon, Seoul. Here, you will find a number of Indian, Pakistani, Turkish, and Arabic-style Muslim restaurants. Here is a list of Halal restaurants for you to enjoy during your trip to Korea. >> List of Islamic Restaurants, Click here! A large-scale Arabic restaurant, Dubai offers an upscale interior décor that exudes authentic Middle Eastern ambience. Food is carefully prepared by chefs from Dubai, attracting a clientele of Korean businessmen who entertain their clients from the Middle East. A variety of lamb dishes, Dubai kebab, and Dubai royal cuisine are served. Visitors can also indulge in the pleasure of a shisha (water pipe) flavored with apple, strawberry, or rose. Usmania is a Pakistani restaurant expressing authentic Pakistani taste in both its interior and food. The menu features about a hundred dishes, ranging from whole wheat bread, lamb, beef or chicken, but does not offer any pork dishes or alcoholic beverages, which are prohibited by the Koran. Inside the restaurant, you will find a variety of Pakistani decorations such as traditional shishas (water pipes) and silk carpets. Beef kebabs and tandoori chicken are favorites among Korean diners. Outside Arabian Restaurant, there is a sign written in Arabic as well as a sign certifying the restaurant as ‘Halal’. It serves a variety of Arabic food using fresh vegetables and traditional spices. The lamb steaks and lamb kebabs are strictly halal. An Indian restaurant, Taj Palace offers a basic menu consisting of curry, naan (Middle Eastern flat bread), and thali (variety of dishes served in small bowls on a tray), a course menu, and a vegetarian menu. All chicken and lamb dishes are halal, and all spices are brought directly from India for the freshest flavor experience in Korea. Taj Palace serves lassi (yogurt drink) and traditional Indian chai, but no alcoholic beverages. Prepared by a chef who previously worked in a luxury hotel in New Delhi, the food is delicious and reasonably priced. Wazwan is an Indian restaurant located next to the Islamic mosque in Itaewon. It serves a variety of authentically flavored Indian food at a reasonable price. Many Koreans visit the restaurant for the spicy Indian-style curry. Their special set menu is especially popular. It includes samosa (dumplings), tandoori chicken, curry, Indian rice, and dessert. Salam was the first restaurants to introduce Turkish cuisine in Korea. It offers kebabs of beef and lamb, as well as other lamb dishes served with vegetables. The Salam course comes with Merjimek soup, kebab, Coban salatasi (a refreshing salad of cubed tomato, sweet peppers, and other vegetables), ayran (slightly salty yogurt drink), tea, and cookie. Located near Gangnam Station, Bindya serves a full menu of Indian cuisine prepared by an Indian chef. Lunchtime diners flock here for the reasonably priced lunch set complete with curry, rice, naan, and tandoori chicken. 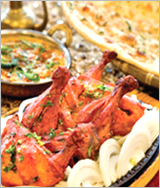 For the authentic flavor of Indian cuisine, come and enjoy one of the curries made from chicken, lamb, beef, or seafood. They even serve a strictly veggi curry. Located near Incheonhang Port, Arabesque serves Turkish kebabs, Indian curry, tandoori chicken, naan, and other halal foods. It is a popular retreat for Arabs in Incheon. How to get there: Subway Line 1, Dong Incheon Station shopping center Exit 6. Samarkand, an Uzbekistan restaurant, serves the country’s popular cuisine, including lamb or beef skewers called shashlik (шашлык), traditional bread lepyoshka (лепёшка), samsa (a patty filled with ground meat), and carrot salad. A traditional Indian restaurant, Shabana is located just outside the campus of Busan University, one of the busy commercial areas in Busan. The restaurant serves a variety of tandoori, vegetarian dishes, dal (a traditional spicy bean soup), chicken, lamb, and an Indian-style rice dish called biryani.